3D digitization offers innovative solutions for documentation, presentation, research and education in the cultural heritage sector. From digital archiving and innovative visualization techniques, to new exhibition formats or printing options, 3D has a broad scope of application. CultLab3D is specialized in automating the process of 3D digitization of cultural heritage artifacts. We offer detailed, color calibrated and cost-saving technologies for museums, auction houses and other cultural institutions. Our scanning technologies, being easy to handle, make 3D digitization possible on a large scale in the first place. They allow for large amounts of objects to be digitized in 3D by providing great efficiency while reaching micrometer precision. Our technologies are adaptable to the respective scanning scenario. They are suited for objects of various sizes, like coins, sculptures or architectural structures. By means of an exact 3D digitization of the geometry, texture and the optical material properties, we ensure the realistic impression of all our 3D models. In our research, we continuously expand the state-of-the-art. CultLab3D is an active member of the Research Alliance Cultural Heritage, which supports the protection of cultural goods by developing new methods and technologies. The alliance was founded in 2008 by the Fraunhofer-Gesellschaft, the Leibniz-Gemeinschaft (Leibniz Association) and the Stiftung Preußischer Kulturbesitz (Prussian Cultural Heritage Foundation). In July 2014, the Staatliche Kunstsammlungen Dresden (Dresden State Art Collections) and Sächsische Landesbibliothek – Staats- und Universitätsbibliothek Dresden (Saxon State and University Library Dresden) joined as new partner. 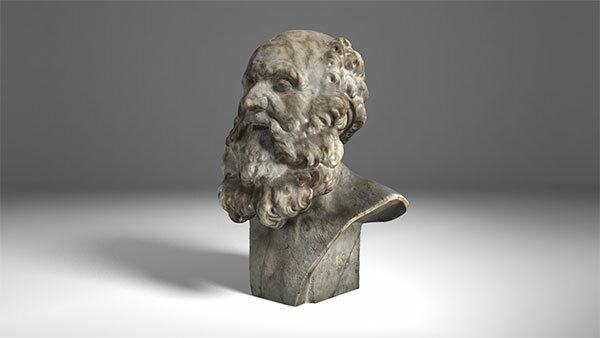 Our technologies allow to digitize entire collections in 3D in an automated and cost-effective way. Numerous museum collections can thus be made accessible to the public and be documented and presented online. Especially our unique scanning pipeline CultLab3D can capture objects in a short amount of time. All our 3D technologies provide a detailed reproduction of the geometry, texture and optical material properties with micrometer precision and in high throughput. Digitizing small objects in 3D requires particularly high precision to allow for a detailed reproduction. Therefore, our patented lens-shifting technology offers high resolution in particular for coins, small fossils or other archaeological finds. Even finest surface characteristics and structures can be captured in detail and visualized in a 3D model. This creates replicas in 3D close to the original. We implement state of the art technologies to digitize complex architectural structures and interiors for a true-to-life reproduction in 3D. Our innovative solutions allow for easy data capture, modelling and further processing, e.g. for additive printing. The resulting 3D models can be used for a wide array of cultural heritage applications, ranging from exhibition design to research and education.